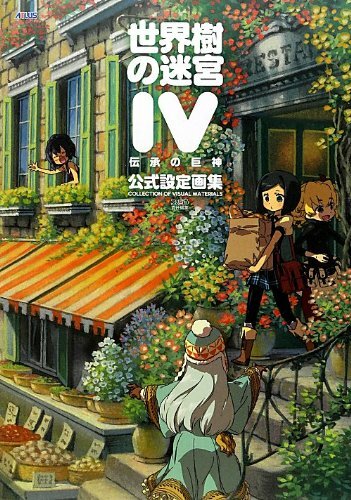 Here's the art book for Etrian Odyssey IV: Legends of the Titan, the video game released on the Nintendo 3DS in 2012. The Japanese title of the game is 世界樹の迷宮IV 伝承の巨神 . The book is presented in similar style as the earlier Etrian Odyssey art books. It's a 224 page paperback. It collects the designs for the characters, enemies and environment art. Characters are in the cute anime style and there are some sketches as well. The art looks great. With the use of blacks, they also have that comic book look. Enemy designs are in sketches and colours. The background environment art are painted and accompanied by colour pencil sketches. The subtle lighting gives places a rather mysterious air. It's yet another lovely art book if you're into Japanese style and chibi characters.